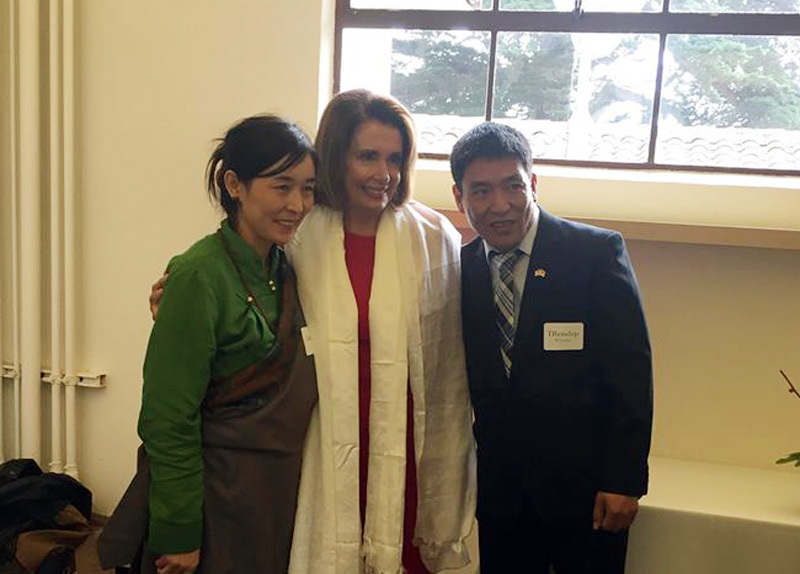 (TibetanReview.net, Jan18, 2018) – US Democratic Party and House Minority Leader Nancy Pelosi has on Jan 14 accorded a public welcome to former Tibetan political prisoner Dhondup Wangchen, complimenting his “courageous escape” from Chinese occupied Tibet to San Francisco where he now lives with his wife and three children. “He was arrested because he made a film about freedom and he was in prison for awhile. When he was released he made his way out of captivity to freedom. And now he is with us and with his family in San Francisco,” Pelosi was quoted as telling supporters at her New Year celebrations meet in San Francisco. Pelosi was also stated to have met with Wangchen, 43, and his family before the welcome ceremony and to have assured meetings with her in Washington DC in the near future. Wangchen arrived in the US and reunited with his family on Dec 25. With the assistance of a monk named Golog Jigme, who escaped to India in 2014, Dhondup Wangchen video interviewed a total of 108 Tibetans from across the Tibetan Plateau, asking them about their life under Chinese rule and their longing for freedom. Both were caught in Mar 2008, but not before they sent out their video recordings which were made into a 40-minute documentary titled ‘Leaving Fear behind’. The documentary was made by Zurich-based Filming for Tibet released ahead of Beijing Olympics of 2008. Meanwhile, Dhondup Wangchen received a six-year jailed sentence in Dec 2009 for allegedly “inciting subversion” of state power. He is now said to be planning to make a film on his escape, about which nothing has been revealed so far.